Dom over at Belleau Kitchen announced that this month's Random Recipe Challenge would be 'Just Desserts'. Yesss! I do desserts. In fact, I actively seek them out and do them. Kay, not so much, as he's watching his diet, but me and Aditi, we indulge. Luckily we are home most days so all signs of our dessertly activity can be hidden well before poor Kay gets back home. I got lucky with this month's random cookbook. I 'only' have about five books that are purely desserts, so I spread them out and got Aditi to pick one out. Guess which one she picked out? Of course, the one with the ice cream cone on its cover. This one to be precise. The recipe I opened up to was the Watermelon Sorbetto. Again, we were very lucky, because we had half a watermelon in the fridge. I ended up adapting the recipe a bit because when I whizzed up the watermelon, I only got 2 cups of juice. 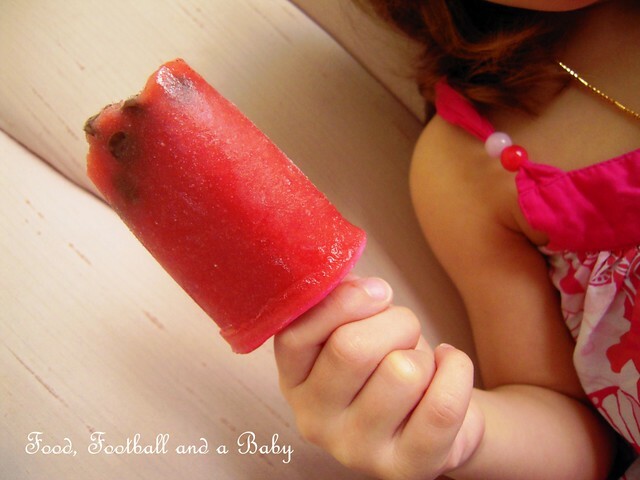 So, I blitzed up about 6 - 7 strawberries, and made this into Watermelon-Strawberry popsicles. Plus, it was way too hot to cook, so I didn't cook the watermelon juice and sugar, as in the recipe. I just whizzed the ingredients in my very powerful blender instead. 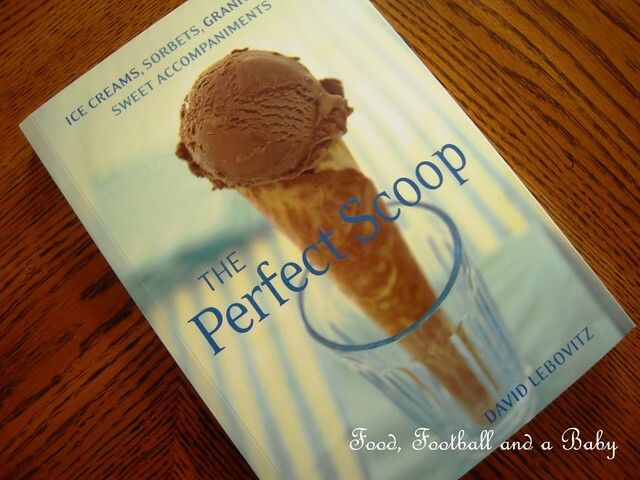 Its David's suggestion in the recipe that this sorbetto makes excellent popsicles, and I agree wholeheartedly. The little chocolate chips look just so cute in them, just like real watermelon seeds. I can just see this recipe becoming a firm family favourite. Blitz together all the ingredients, except for the chocolate chips. Once well mixed, add the chocolate chips, if using, and stir. 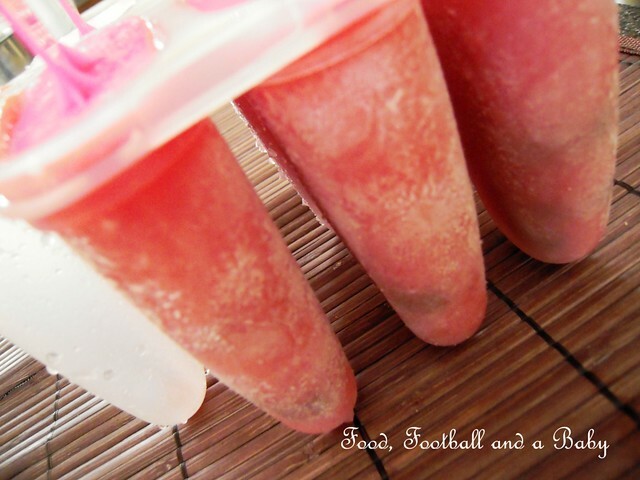 Pour gently into popsicle moulds, and freeze till hard. 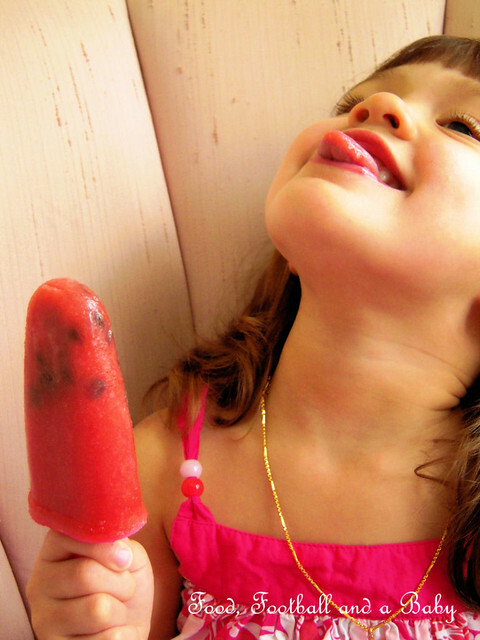 You can also make a sorbet instead of popsicles by churning the mixture in an icecream maker instead. Eeep, the photos are so cute! Awesome recipe too, perfect for a hot day. Or a warm one or cool one or raining or whatever.. I could really have used one (or two) of these today during a hot afternoon in the garden. I'm impressed at your speedy response to the challenge - it makes me feel so slow. Do you know I was just looking at that exact book today? Those ices look so good and I've been on a sorbet/ice cream making kick lately. Thanks so much for linking this up to Sweets for a Saturday. With a recipe like this, I'm looking forward to when watermelon finally comes on sale. What a perfect way to get ready for summer! Watermelon and Strawberry sound like the perfect combination. I can tell your little girl is enjoying her ice pop a lot! :) Thanks for sharing and have a wonderful weekend. They look lovely, so refreshing. I need to get myself some ice lolly moulds for this summer! They look great. I am going to go and look on Amazon for ice lolly moulds - would love to make these. And your photographs are gorgeous. Yum! Cold watermelon and strawberries! 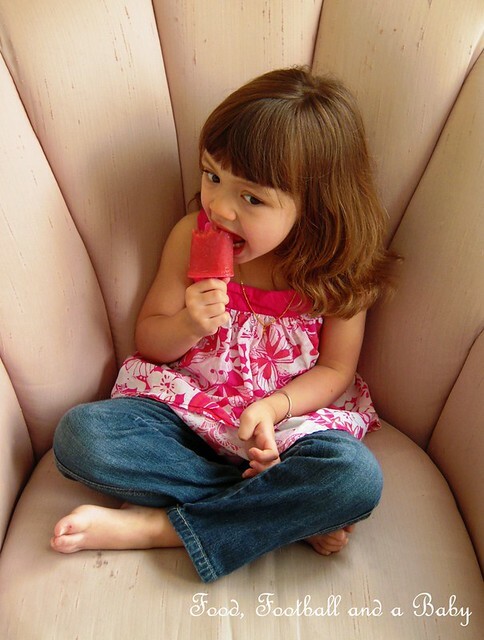 Your little popsicle slurper looks to be enjoying that pop! It's coming on ice cream and popsicle weather here in New England! These will be a treat for our 4th of July BBQ! Thanks so much for posting them at the Random Recipe Challenge! Just love finding new blogs that inspire! I can't wait to try this with the boys, and I can't wait to come and peek around your blog some more!